Sadská is situated at an elevation of 185 m on the left bank of the river Šembera in the Labe (Elbe) lowlands, about 7 km south of the district town Nymburk. The municipality of Sadská has a population of about 3,300 (2017). The earliest written mention of the place dates back to AD 993, when its name appears in the founding charter of the monastery of B&rcaron;evnov. 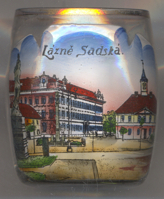 In the 12th century, Sadská used to be a P&rcaron;emyslid princely court, the county's administrative centre. The chapter of the collegiate church of St. Apollinaire (built in 1117/1118) was transfered to Prague in 1362. The new part of the village was promoted to a small town in 1562. 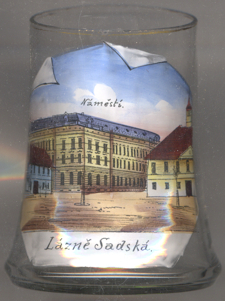 In 1607, the town obtained the same privileges as nearby Pod&ecaron;brady. In 1784 it was chartered as a town. Originally part of the administrative district Pod&ecaron;brady, Sadská became part of the district Nymburk in 1942–1945 and finally in 1949. The Town Hall [right], located in the square Palackého nám&ecaron;stí, was built in 1842–1843. The school building in the corner of the square [left] is a dignified landmark. It was built in 1902 by architect Antonín Turek . The Plague Column [right, no. 3317: foreground far left] was created in 1748. The parish church St. Apolinaire [bottom picture, centre background] originated around 1370. The church was remodeled in Baroque style in 1737–1739 following designs by Kilian Ignaz Dientzenhofer.